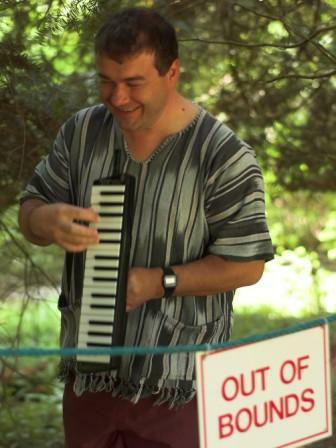 Jim Pywell is a composer and multi-instrumentalist, specialising in improvisation on bassoon and melodica. He plays these and also percussion in the new Kenyan band Kachumbari Seven and is also a member of the UK-based song band Nankivell's Optet. Born and raised in London, he studied composition to Masters’ level at the University of Huddersfield and his work as a musician draws on a diverse range of influences. He has collaborated with dance, theatre, jazz, pop, ethnic and folk artists, working in various settings such as universities, schools, theatres and community settings. His compositions are performed regularly in the UK and elsewhere. He has worked in Kenya, Spain, South Africa, Zimbabwe and Turkey, and was based in the north of England for many years. From 2000 - 2003 he held the post of Fellow in Music at the University of Bradford - a dual role of Musician-in-Residence and Artistic Director of the University's extra-curricular music programme. From 2003 to 2007 worked as Assistant Lecturer in the Department of Music and Dance at Kenyatta University, Nairobi where he taught ensemble skills, analysis of 20th century music, composition and performance. His current activity includes working as Musical Director of the National Youth Orchestra of Kenya.